Like nearly everyone else that travels by train I always have an eye for a bargain - because the "ordinary" walk-up fares are so high. So I look out for Advance purchase tickets and take advantage of split-ticketing whenever the savings are great enough to compensate for the loss of flexibility of route and timings. And of course I always travel "standard" (or "second" as I still think of it) class. But recently I've begun to think about First Class. After a lifetime of being a second-class traveller but now with a reasonable income and very few financial commitments I've started thinking that it's now or never if I am to enjoy the benefits of joining my betters in First. It started two Christmases ago when Hilary and I booked a rail package holiday to Switzerland. It offered a decent hotel (far better than anything we'd have booked ourselves), inclusive rail travel (at least from London) and unlimited train and bus travel when we got there, so naturally it cost an arm and a leg. But for just another arm you could go First Class - and as the second-class price was far more than we'd ever spent on a holiday before we decided to bite-the-bullet and go First. All the way. To Switzerland. Now I'm hooked. Not completely though. When I can get to London from Lancaster for £65 (with railcard) on a ticket that allows me to travel on almost any train I'm not going to shell out £330 for a First Class equivalent. That would be stupid. But increasingly I've noticed that it's possible to get a First Class Advance ticket for less than the cost of a Standard Class "any train" one so quite often that's what I do. In February, Hilary and I went to Glasgow for the weekend travelling First Class on exactly that basis. The outward journey was spoiled somewhat when we were all turfed off the train and put on coaches at Carlisle due to a problem with the overhead wires, but the ensuing delay meant we got a 100% refund for that leg of journey - and we got to keep the free food and drink that we'd consumed as part of the First Class package. Then, a fortnight ago I got a bargain fare to Crewe and back. £7 each way Advance First Class as against £29 for a standard return. Admittedly Advance standard class tickets would have been even cheaper, but that's hardly the point. Food is included by Virgin Trains in First Class fares but it doesn't always work out on short journeys. Due to a crew change in Preston the staff didn't start taking orders for breakfast until we were at Warrington, where I had to agree with the server that there wouldn't be time for them to cook and serve me a meal and for me to eat it before we got to Crewe, so I had to settle for toast and a coffee although that more than made up for the extra First Class fare. The reason for my trip to Crewe was to restart - tentatively - my paused bus excursion around the county towns of England. I completed a stage from Cheshire to Staffordshire and you can read about it here. Oh, and if you are tempted to try First Class travel based on my experiences a word of warning. The food offer varies enormously between the different companies. On a recent Trans Pennine journey from Sheffield to Manchester we were all offered a cup of coffee and then told "Well, I've only got one packet of biscuits left - who wants 'em?" Once a month Hilary and I go to our local Arts & Community Centre for the Silent Movie Club meeting. Yesterday's film was the 1920 Classic "The Mark of Zorro"
We usually cycle the 2km there and it generally takes twelve minutes, plus a few more to get the bikes out at home and lock them up when we get there. But yesterday the weather was awful and I had no lights for my bike. Hilary wasn't going so I was going to walk, which takes about 25 mintues, although I'd usually allow a good half-hour. The Centre is across town and takes two buses, which is why I don't usually consider it as an option, but when I realised there was a bus due in four minutes that would take me halfway there I thought I'd give it a go. I left home at 19.22 precisely and got to the stop three minutes later (after an uphill walk) just as the bus came into view. I got straight on and despite stopping at every bus stop en-route and every traffic light we got to the city centre in five minutes. As I got off, at 19.31 a bus that would take me the rest of way (which only runs every 30 minutes) came round the corner -also bang on time - and I was there by 19.35. The downside was that the film doesn't start until 20.00 so although the bus ride was free, it actually cost me the price of a pint while I waited! But if only every bus journey could be so good! This blog was originally started to record my adventures on my narrowboat Starcross, which I owned between 2004 and 2014. Owning a boat was something I'd wanted to do for many years and I'm pleased I did it and will look back on it with great pleasure. But canals have always had to vie for my attention with the other great love of my life: buses. And buses always had the advantage that they run in the family. My grandfather started work as a groom to a local landowner who went under the Catch 22-esque name and title of "Major Mynors". One day, the Major called him into his study and told him he was getting rid of the horses and was going to buy one of those new-fangled motor cars. 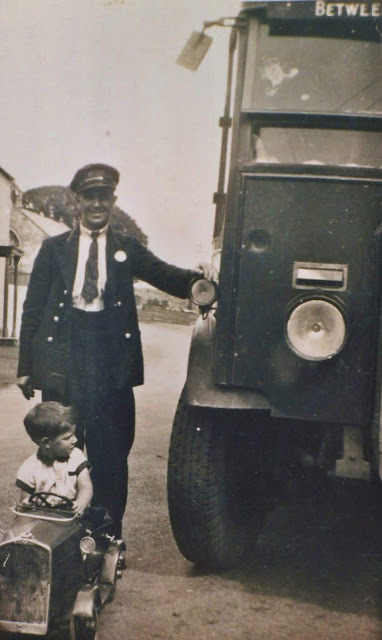 Grandad's job was to get the train to Coventry, watch the men building the car in the factory, find out how it worked...and DRIVE IT BACK TO CARMARTHENSHIRE! 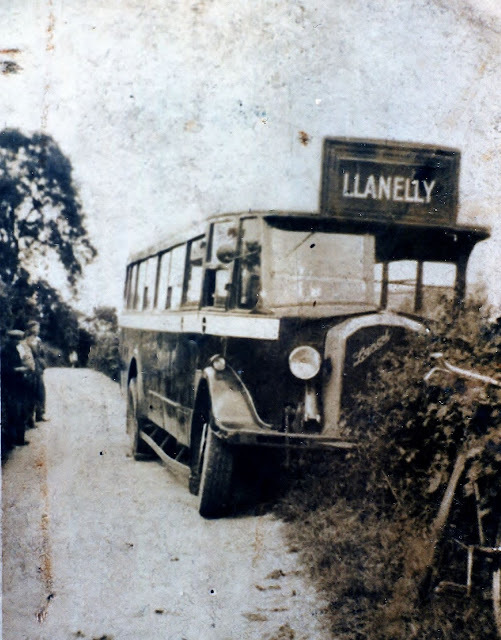 Later, he joined the South Wales Transport Company as one of their first drivers at Llanelly depot and spent the rest of his working life driving buses between there and Swansea, Carmarthen and surrounding towns and villages. I recently found some old photographs, dating from 1936 which must have been given to me by my uncle, a keen family historian. The next has a caption on the back describing it as the "Corona Pop Factory Trip". Grandad is on the extreme right in his white summer uniform. My dad is also on this one, fourth from the left on the back row. He'd presumably blagged a seat on the basis that his dad was the driver (my mum and I did the same when dad drove coaches on day trips for a local coach operator - he'd pick us up at the side of the road out of sight of the depot). "Corona" was still a popular soft drinks brand in my own childhood, but the factory was in the Rhondda valley so this was presumably a trip to visit it, rather than a works outing. Lastly, Grandad's bus seems to have come to grief on the road somewhere between Carmarthen and Llanelly. Family legend has it that he had to drive into the hedge to avoid an oncoming vehicle and therefore it wasn't his fault, but the bus, a Dennis Lancet, would have been nearly new at the time so I bet his boss wasn't too pleased. Grandad's bus driver's hat and almost certainly the one he was wearing in the first picture! Unfortunately it was too small for me to be able to wear during my own bus conducting and driving days but it's a link with the past, with grandad and with the South Wales Transport Company, which is also no longer with us. I've never understood why so many people like travelling by car. You need to pay so much attention to the road ahead that you miss anything of interest along the way. Even if you do see something interesting, by the time you've found somewhere to stop safely you are so far away that you can't be bothered to get out ad walk back to have a closer look. You see so much more from the bus, but even if you can get off nearby you're then faced with a potentially long wait for the next bus to come along and rescue you after your curiosity has been satisfied. Cycling is the way to do it and over the years I've noticed and been able to investigate so many things on the roadside that I could never have done travelling any other way. Take milestones. The need for them largely disappeared with the coming of motorised transport and few, if any, new ones have been erected since. Distances have even disappeared from signposts now that its no longer necessary for travellers to calculate whether they have the time - or the energy - to reach their destinations safely. But many of the old milestones are still there and over the years I've taken a fair few photos of them. They come in all sorts of shapes and sizes and with varying degrees of information for the traveller. Take the two I found on a bike ride during a few days away in the West Riding of Yorkshire near Sedbergh over New Year. Quite a lot of information on this. It identifies the road (Sedbergh & Kirkby Stephen) as well as the location (Cautley) plus, of course, the distances to (and from) each end of the road. Unusually, the lettering is picked out in red rather than black, although whether this is original or a modern incarnation I don't know. The other, which I found on the road from Sedbergh to Dent is minimalist in the extreme and one of a series that stretch at least as far as Dent. The "1" obviously means "one mile" whereas "S" must stand for "Sedbergh" Unlike the first example no distance to the other end of the road is shown. Perhaps the village of Dent - about 7 miles further on - wasn't considered significant enough to warrant people being told how far away it was. Yorkshiremen are notorious for not wanting to incur unnescessary expenditure but whoever made these surely couldn't have pared costs any further! I had three breakdowns, one new engine, rescued one other boat in distress and didn't fall in the cut even once!